I have been trying to figure out what show this story came from for the last few years. A scientist is on the brink of creating a fully realized artificial world for the first time, complete with its own inhabitants. He explains to an incredulous colleague who thinks that the inhabitants will realize that they are in a simulation that since these people never alter their daily routines, they will never discover the edges of their world, and thus will not learn the true nature of their reality. The episode ends with the scientist being questioned as to whether he has ever adjusted his own daily routine in an unexpected way, and his realization that he has not. 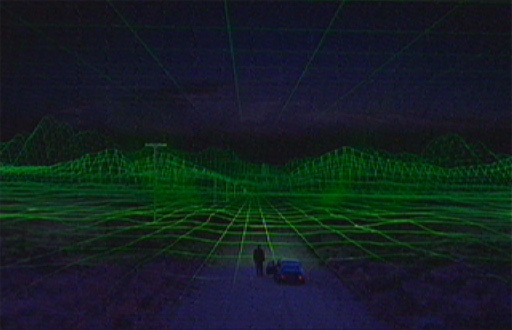 He drives down a road out of town in a way that he has never gone before, and suddenly discovers that the edge of town disappears into a grid of unformed nothingness, and he realizes that he is in fact living inside a simulation himself. This is the earliest representation of simulation theory that I remember seeing on TV - but I have no idea what show it was from. I have a feeling it may have been The Outer Limits, or The Twilight Zone, but having read all of the episode synopses of both shows, none of them seem to be this story. Has anybody here ever heard of this? Pretty sure this is the movie The Thirteenth Floor. In particular the scene with the scientist driving out of town and hitting a grid like end is a dead ringer for the movie. "This leads Hall to perform an experiment outside the VR system, something that Fuller’s letter instructed him to try: drive to a place where he never would have considered going otherwise. He does so, and discovers a place that resembles a wireframe model. Hall grasps the truth, the meaning of Fuller's message: 1990s Los Angeles is itself a simulation." the scientist manages to 'upload' to the higher reality which is running his simulation: "David's death as Hall in the 1990s simulation allows Hall’s artificial consciousness to take control of David’s body in the real world. He wakes in 2024, connected by a device to the VR system."